The Flash’s first go-go checks cover is a really nice one. It’s a beautiful Carmine Infantino layout inked by Joe Giella which is different since Joe didn’t ink a lot of the covers. It’s again pretty obviously one of Julie Schwartz’s gimmick covers (in fact he cops to it in issue #161) and this this comes with a double gimmick. Julie assigned Gardner Fox to write the story for this cover and in issue #161 he’ll have Bob Kanigher write a different story based upon the same cover. As much as I didn’t care for stunts in my comics, as an aspiring comics creator, I did find the prospect interesting. 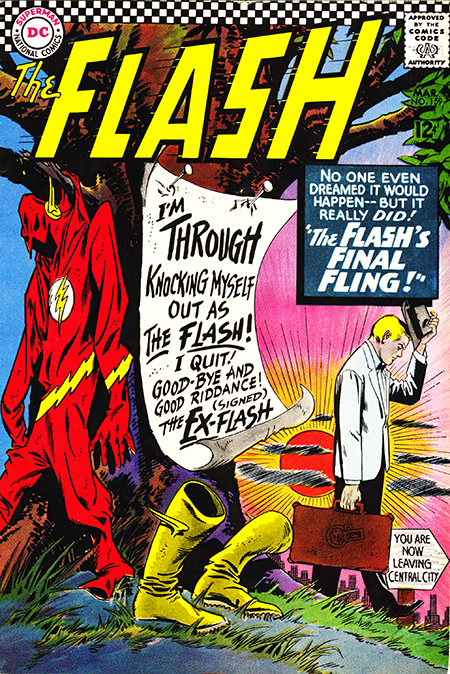 Being Gardner Fox, his story naturally has an SF bent. We first see Barry angrily eschewing his role as the Flash until Kid Flash takes him to Earth Two to visit Dr. McNider aka Dr. Mid-Nite which adds a nice layer of cool to the story, but the closest we come to seeing Dr. Mid-Nite is his uniform hanging in the closet. Dr. McNider puts Barry in a narco-synthetic state from which we learn that Barry was visited by a chronal officer from the year 3780. We ascertain that a master criminal named Frand Matter has placed a bomb in Central City in 1966. The coronal officers learn that the Flash lived in Central City in 1966 and that, if he uses his super speed, the vibrations he creates will set off the bomb. Why the bomb wasn’t set off when Kid-Flash vibrated the two of them to Earth Two is never explained. However, since they’re on Earth Two the flashy duo can vibrate to the future where they capture Frand Matter, but not before he sets of the bomb in Central City manually. The two Flashes arrive back in Central City just as the bomb explodes and they drive the explosion harmlessly into the upper atmosphere. All in all a nice little SF time travel piece. The second story involves Iris’s dad Professor West which a welcome idea as far as it goes, but it unfolds just like the professor’s previous two outings have with the professor being the unwitting dupe of a trio of criminals. Even the number of criminals is the same. These the Professor as Mr. Magoo stories were getting a little too receptive at this point. I don’t mind spilling the same wine once in awhile but these Professor West stories are starting to leave a stain on the carpet.